The importance of online marketing and eCommerce to businesses continues to grow, with the retail industry generating an estimated $3.92 trillion annually, 4.2% of which is done online ($164.5 Billion)1. As online marketing and eCommerce segments’ share of business revenue grows, so too does the importance of utilizing best practices in design and technology, as well as having the right marketing strategy. Consequently, the importance of Internet marketing and commerce as a percent of sales is transforming the perception of the quality and know-how needed to generate attractive online sales and ROI. This case study evaluates how the choice between templated versus custom eCommerce solutions impact companies’ ability to tap into this opportunity. Merchants today have innumerable options to choose from, ranging from out of the box eCommerce shopping carts costing $1,000 or less to custom eCommerce solutions and marketing programs that range from tens to hundreds of thousands of dollars. Given the gradual predominance of online in companies’ sales, it’s ever more important to carefully assess eCommerce solutions based not only on cost, but their ability to achieve organizational goals. At a basic level, successful eCommerce entails developing an understanding of a business’ target customers, where they can be found, the cost of bringing them to a web site, and the most effective methods to turn those visitors into customers when they reach the site. The lure of inexpensive solutions and the impact that they have on companies’ eCommerce performance is the focus of this case. Our Client, a marble product cleaning company owned an eCommerce web site that, in 2009, suffered from falling sales, despite stable spending on paid placement advertising. The company was on its second redesign, have chosen an out of the box solution for its apparently attractive combination of features and cost. However, that design actually hurt sales since the underlying product could not support a custom design or proper search engine optimization, which affected its search engine traffic and site conversion (this is the percent of visitors that complete a purchase). The causes for this, as Polar Design’s standard online Assessment uncovered, were a range of seemingly small issues that, in combination, hurt the company’s web site performance. The site exhibited a high bounce rate of 68%, which means 68% of visitors left immediately after the 1stpage they saw. This was one contributing factor to the site’s low conversion rate of only 1.1 percent. As a point of comparison, the average eCommerce conversion rate for any eCommerce site is approximately 2.2%2. Polar Design identified the web site’s design, cluttered layout, slow page loading, and difficult to use shopping cart as key factors. In addition the people who were remaining on the site were only visiting 2.5 pages of the site on average, which meant that the web site was not engaging visitors to learn more about the company’s products. Besides the user experience, the web site had also seen a drop in organic search traffic and links from third party websites. The technology platform used for the eCommerce site lacked many features that allow for effective search engine optimization (SEO). As a result, for many keyword searches relating to Marble & Granite Care Products, the company’s web site did not even appear in the first ten pages of search results. Along with low organic placement in search engines, their pay-per-click campaigns were not yielding the results they hoped for, and left them with a high cost per customer of over $40. The site was also lacked remarketing capabilities, which prevented it from generating new sales from its existing customer base. The templated solution that Marble had obtained offered limited support of discount codes or an e-mail newsletter. The last and perhaps greatest challenge was that because of the company’s flagging sales, a sufficient budget did not exist to solve these issues by implementing a quality eCommerce site and online marketing campaign. This reality made it a challenge for the company to consider custom eCommerce solutions and online marketing campaign even though it recognized that need. An analysis of the website’s myriad issues, from design, to coding, to SEO revealed that the only feasible solution would be a complete redesign of the web site to a more attractive look, less cluttered layout, and more robust technology platform. Attempting to “fix” its existing platform would require more development time to implement, test and manage than building a fresh site on a sound foundation. The first objective Polar Design’s solution addressed was decreasing the bounce rate of the site. A site’s bounce rate and conversion is rarely the product of one or two simple factors, but rather the interaction of site speed, design, and organization. Many templated or out-of-the-box eCommerce solutions reuse extensive code that slows site performance down, or they require use of uninspired, indifferentiated templates or layouts. The logic that proponents of templated solutions rely on is reduction of the cost of building these web sites. However, the result is often lower performance due to issues that visitors may have with site performance, ease of use, or the “canned” look so common with such solutions that lowers potential customers’ identification with the brand, comfort and trust. Polar Design’s solution involved a completely customized design intended to make the company appear professional and unique. The design was implemented in the InsightBuilder® ECOM eCommerce platform, which not only accommodates virtually any web site design but performs quickly, with less than 50% of the load time of many other competing eCommerce platforms3. Polar Design first created a detailed branding and web site architecture document to outline clearly for all stakeholder’s the site objectives, target customer, and an interface architecture to properly present the company’s products in an appealing way, without clutter, and with an easier to use navigation. The document took into account pre-existing content and videos and included a plan to better organize and present that information as well. The design team then developed site designs based on this architecture document and implemented them into InsightBuilder® ECOM, along with SEO and a short, Flash presentation for the home page that showcases the four product lines in a captivating and clutter free manner. Finally, Polar arranged and oversaw photography of new, brighter product photos. Another matter that required addressing was the site’s SEO. Polar Design’s standard online marketing Assessment uncovered a range of coding issues and limited keyword use within the site. Again, the use of the InsightBuilder® ECOM platform was an important step to solving this with its improved support of SEO friendly URLs and dynamic meta tag generation. Polar Design’s online marketing professionals developed a revised keyword list implemented by the coding team. The SEO team as a whole also initiated a link building campaign using a variety of tactics to improve the site’s link popularity, which leads to higher search engine ranking. Along with the SEO, Marble & Granite Care Products needed to minimize their cost per click to reduce the overall cost of traffic as it related to sales. Polar’s online marketing professionals analyzed the existing PPC and implemented a program of continual improvement that involves campaign testing and the deployment of highly detailed reporting and analysis. This allowed the team to identify the ROI of individual keywords and ads more readily, as well as identify new keywords and ads that had been overlooked. Over the course of several months, the team proceeded to optimize the campaign, adjusting ads and keywords based on incoming data, leading to a 24% drop in the cost to acquire new customers.The marketing team used InsightBuilder® ECOM re-marketing features such as its discount code and specials functionality, as well as its more robust e-mail newsletter system to reach out to past customers to drum up more sales. The team developed the concept and copy for these newsletters. Regular newsletters coordinated with well timed offers added additional sales from past customers. Finally, the last but by no means least important (or easiest) objective was fitting all of this effort to the client’s cash flow, which the previous templated solution had reduced. With is propriety Internet marketing model built on years of data, Polar Design was able to develop reasonably accurate projections of the improvement the client could expect with a new, completely customized solution. As a result, Polar Design was in a position to offer the client work on a performance basis. The client obtained a high-end, complete solution with an up front cash commitment equal to 50% of the price of the solution. The remaining value was rolled up into a performance bonus paid to Polar upon the web site reaching key sales targets. 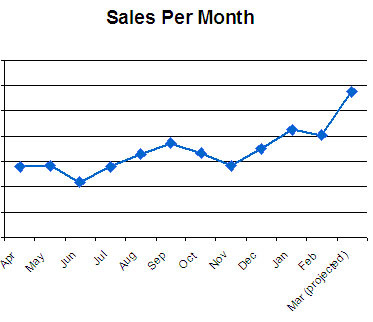 After launching the new site in late November, 2010 the company has seen their sales increase by 27% per month. It is projected that at the end of March 2011 the sales will have increased by up to 70% per month. The decrease in the bounce rate from 68% to 46.19% as well as generally improved site design, layout and targeting in the PPC campaigns have contributed to a rise in the conversion rate above 3% (a nearly 200% improvement). In addition, web site visitors now view 4.11 pages on average indicating that improvements to navigation and layout are attracting them to review more of the company’s detailed and rich content. All of these are factors in increased site sales. Since the launch of the new site Marble & Granite Care Products has seen significant improvement in their organic traffic of 20% per month. The company is now listed as the number one result for many long tail keywords and on the first page of results for many others including: Grout Cleaning Product, Marble refinishing, Grout Care Products, Marble Gloss Restorer, etc. 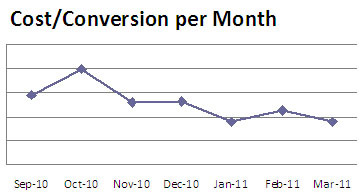 Even the pay-per-click campaign improved, in fact, since the cost per customer declined 24%. As eCommerce continues to grow from a significant to a dominant portion of the retail market, getting the entire process right is crucial. Companies that approach eCommerce and development as a product or a cost item, rather than an investment, will continue to garner disappointing results. Customization, despite its cost, shows the most promise in achieving the aesthetics and functionality needed to provide customers a tailored experience that in turn leads to higher sales and ROI. Relying on custom eCommerce solutions that are built around a company’s unique attributes calls for an eCommerce team that drives design and technology with strategy and organizational goals. Finally, an iterative approach to online advertising that is heavily rooted in data collection and analysis provides companies far better results for the ad dollars spent. An integrated, customized and quality approach like the one described above costs more, but brings a higher return. The Marble eCommerce web site is on track to exceed a 50% ROI in its first year of operation taking into account the cash flow from new sales as well as all site development fees, bonuses, and marketing fees. With templated design and out-of-the-box eCommerce solution, achieving any return is in question. As this case shows, the importance of planning eCommerce and online marketing on the basis of results and ROI, rather than cost, is paramount. Enter a term you're look for and hit enter. Try it, its not bad! Our web site navigation two levels deep. Welcome all search engine spider and humans bored with menus. a registered trademark of International Marketing Services, LLC.